Accurate dose assessment for the radiosensitive tissues of the bone and marrow is desirable for applications in both radiation therapy and occupational radiation protection. This talk will summarize the methods involved in determining two quantities necessary for computing radiation doses to radiosensitive skeletal tissues from charged particles originating in the skeleton. These quantities are the fraction of source energy deposited in the tissue of interest, or absorbed fraction, and the masses of the skeletal tissues. In order to achieve this, high-resolution CT images of skeletal sites harvested from cadavers are coupled with radiation transport algorithms. This talk will summarize the methods involved for handling a variety of charged particle radiations including electrons, alpha particles and protons. Though unrelated to the topic above, the speaker will also briefly summarize three health physics apps developed by Francis Marion students coming soon to the Apple App Store. 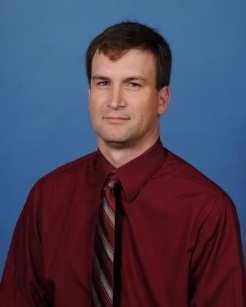 Derek Jokisch is a Professor of Physics and Health Physics at Francis Marion University where he is in his 14th year. He earned his bachelor's degree in nuclear engineering from the University of Illinois and his master's and doctorate in health physics from the University of Florida while on a Dept. of Energy Fellowship. He has received the FMU Research Award and is a Distinguished Professor at Francis Marion. In 2010, he received the Elda Anderson Award from the Health Physics Society. Most recently he and his colleagues received the 2011 Roberts Prize from the Institute of Physics and Engineering in Medicine for their skeletal dosimetry paper published in Physics in Medicine and Biology.